Desulfovibrio desulfuricans, Xestospongia muta, anti-dormant, alkaloid. Desulfovibrio desulfuricans is a Gram-negative sulfate-reducing and acid-fast bacteria that can be found in soil, conservation, and animal waste. This bacteria can produce endogenous Hydrogen sulfide in the central nervous system, liver, kidney, cardiovascular system, lung and gastrointestinal tract that can used as an opportunistic pathogen associated with primary bacteremia and stomach infections [1,2]. This bacteria is a gram-negative bacteria that Several studies have reported that respiratory, vascular, metabolic and neurologic systems are the main targets of the bacteria so that the number of deaths caused by D. desulfuricans bacteria reaches 90% per year . The bacteria produces enzymatically produced hydrogen sulfide via transsulfuration pathways by cystathionine-β-synthase (CBS), cystathionine-γ-lyase (CSE) and 3-mercaptopyruvate sulfurtransferase (3MST) activity [4,5]. The treatment of Desulfovibrio's infection is still not satisfactory. Patients have been treated with various antibiotics, including miltefosine, metronidazole, doxycycline, ceftriaxone, cefotaxime, ciprofloxacin, and ampicillin. But the results obtained are far from what is expected . Several studies have been carried out such as using beta-lactamase to positively show MIC50 activity in penicillin>4 μg/ml; amoxicillin-clavulanate 0.5 μg/ml; ampicillin-sulbactam 1.0 μg/ml; ceftriaxone 16 μg/ml; cefoxitin>128 μg/ ml; and metronidazole 0.125 μg/ml; clindamycin 0.25 μg/ml; chloramphenicol 8 μg/ml. However, positive beta-lactamase which is synthesized to cause dependence on its use. So it is hoped that the discovery of marine natural products to overcome the problem . Until now, the handling of diseases caused by D. desulfuricans bacteria has been carried out to date using commercial drugs namely miltefosine but also has side effects namely diarrhea and itching. Another alternative was done to overcome the disease from D. Desulfuricans bacteria is by using natural materials produced by marine organisms such as sponges and microalgae . The study of the use of natural materials derived from the sea such as sponges has been widely practiced. However, the study of the potential of the sponge as an antibacterial is still very limited . The use of marine natural origin materials from sponges has been introduced as a potential new drug model. X. muta have activity as antimicrobial, cytotoxic, antitumor, antiviral, immunosuppressant, and enzyme inhibition . Natural products from marine organisms such as sponge are very potential if used as anti-bacterial, anti-fungal and anti-cancer. And has been widely reported, but the natural materials sourced from Sabang waters utilization is still limited, so it becomes an opportunity for us to exploit with the aim to know the potential of marine natural resources in Sabang Island. Shimadzu C196-E061R Prominence HPLC is used in C18 column with Photodiode Array (PDA) detector. 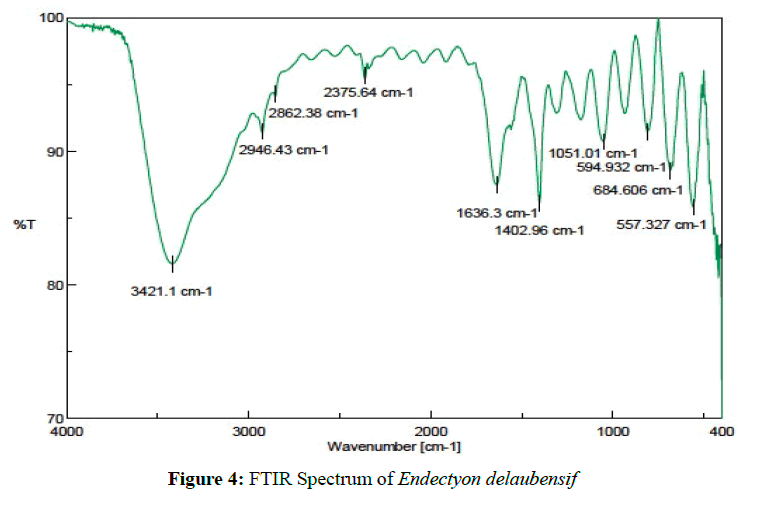 The IR spectrum is obtained from Shimadzu IR Prestige FTIR 21. Sponge Clathria sp., X. muta, and E. delaubenfelsi are collected in Sumur Tiga and Anoi Itam, Sabang Island, Indonesia 2018. The three types of sponge are taken at 20-35 meters. Sponge Storage at Marine Chemical Laboratory, Marine Science Study Program, Faculty of Marine and Fisheries. Sponge Analysis at Laboratory of Natural Products for drug discovery, Graduate School/School of Pharmaceutical Science, Osaka University, Japan. Clathria sp. (32.8 grams of methanol crude) partitioned using n-Hexane: EtOAc: EtOH (1:1:1 v/v) produce n-Hexane fraction (1.43 g), EtOAc fraction (9.64 g), and fraction EtOH (21.73 g). Based on bioactivity results showed that EtOH fraction has cytotoxic [21,73 g (MIC50=10 μg/mL)]. Furthermore, ethanol fraction (21.73 g) fractionated using open column of chromatography (OPN-C18) with EtOAc: EtOH: 0.1% TFA produce 4 fractions. The third fraction has activity [7,88 g (MIC50=0,5 μg/mL)] and purified using HPP RP-18 column with MeCN: H2O: TFA 0.1% gradient obtained 7 fractions. The bioactivity of the fourth fraction [2.74 g (MIC50=0.3 μg/mL)] showed cytotoxic activity against mycobacterial D. desulfuricans. X. muta (24.5 grams of methanol crude) partitioned using n-Hexane: EtOAc: EtOH (1:1:1 v/v) obtained n-Hexane fraction (0.23 g), EtOAc fraction (6.28 g), and EtOH fraction (16.53 g). Based on bioactivity results showed that EtOH fraction has activity [16.53 g (MIC50=12 μg/mL)]. Then, Ethanol fraction (16.53 g) fractionated using an open column of chromatography (OPN-C18) with EtOAc: EtOH: 0.1% TFA gradient so that produced 4 fractions. The second fraction [9,82 g (MIC50=10 μg/mL)] purified using the RP-18 MPLC column (MeCN: MeOH) gradient obtained 7 fractions. The third fraction has activity [4.28 g (MIC50=0.5 μg/mL)] and repurified using HPLC RP-18 column (MeCN: H2O gradient) produce 5 fractions. The activity of the fourth fraction [0.15 g (MIC50=0.1 μg/mL)] showed cytotoxic activity against mycobacterial D. desulfuricans. E. delaubenfelsi (42.85 grams of methanol crude) partitioned using n-Hexane: EtOAc: EtOH (1:1:1 v/v) produce n-Hexane fraction (3.46 g), EtOAc fraction (27.83 g), and EtOH fraction (11.58 g). Bioactivity results shows that EtOAc fraction has activity against mycobacterium [27.83 g (MIC50=20 μg/mL)]. Then, EtOAc fraction (27.83 g) fractionated using open column of chromatography (OPN-C18) with EtOAc: MeCN gradient obtain 6 fractions. Activity of the fourth fraction [12.45 g (MIC50=14 μg/mL)] and purified using column 5C-18 MS II HPLC with eluent CHCl3: MeOH: H2O low phase gradient obtain 9 fractions. The fifth fraction activity [3.36 g (MIC50=0.5 μg/mL)] repurified using column 5C-18 MS II HPLC (MeCN: H2O: TFA 0.1% gradient) produce 5 fractions. The activity of the third fraction [1,13 g (MIC50=0.3 μg/mL)] shows cytotoxic activity against mycobacterium D. desulfuricans. D. desulfuricans was maintained at 37°C on Middlebrook 7H10 to supplemented with 10% Middlebrook OADC and 0.5% glycerol, or in Middlebrook 7H9 broth containing 10% Middlebrook OADC, 0.2% glycerol [11,12]. MIC values against D. desulfuricans were determined by using the established MTT method. Midlog-phase bacilli (D. desulfuricans: 1 x 104 CFU/0.1 mL) were inoculated in a 96-well plate, then serially diluted samples were added. For aerobic conditions, bacteria were incubated at 37°C for 36 h (D. desulfuricans) [13-15]. The minor modifications was added for the hypoxic conditions . Mycobacterial were grown in Middlebrook 7H9 broth at 37°C under nitrogen atmosphere containing oxygen (0.2%) until OD600=0.8 [17,18]. Subsequently, Mycobacterial were inoculated in a 96- well plate (same density) under aerobic conditions and incubated at 37°C under the nitrogen atmosphere containing oxygen (0.2%) for 36 h (D. desulfuricans). After incubation, MTT solution (50 mL, 0.5 mg/mL) was added to each of the 12 h under aerobic or hypoxic conditions. OD560 was measured to determine MIC value [19-21]. D. desulfuricans was grown in Middlebrook 7H9 broth at 37°C under the aerobic condition or nitrogen atmosphere containing oxygen (0.2%) until OD600=0.8. D. desulfuricans culture in Middlebrook 7H9 broth was adjusted to 1 x 106 CFU/ mL, then extract (4 x MIC) was added . An aliquot (100 mL) was collected at each time point, and serially diluted cultures were listed on Middlebrook 7H10 in order to measure CFU. The numbers of colonies were counted after 36 h incubation [23,24]. Compounds that have been isolated has different MIC50 values (Figure 1). Clathria sp. [(2.74 g ) MIC50=0.9 ug/mL] was isolated as a colorless solid. 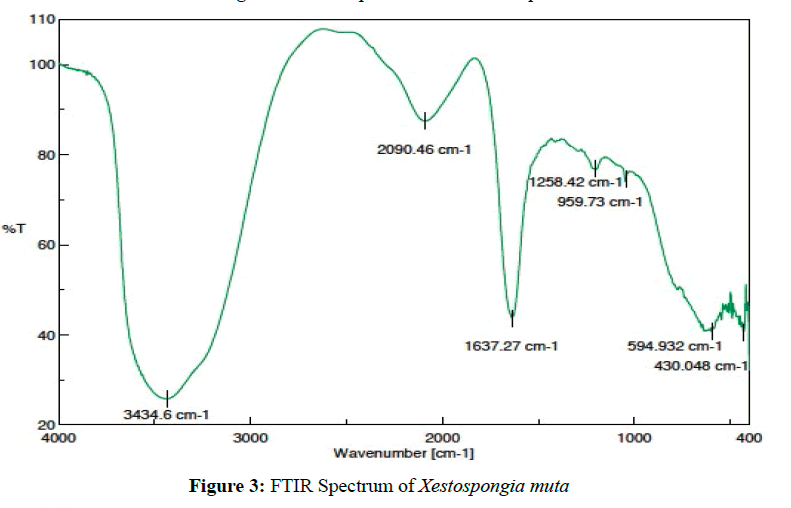 FTIR spectrum shows that the active metabolite has N-H secondary amines 3435.56 cm-1 with the fingerprint region of C-N imine (1637.27 cm-1), C-H methyl (2853.39 cm-1), C-H methylene (2769.64 cm-1) (Figure 2). Interpretation of data indicates that the active metabolite compound as an alkaloid [25,26]. Xestospongia muta [(0.15 g ) MIC50=0.2 ug/mL] was isolated as a colorless solid. Based on the FTIR spectrum shows that the active metabolite has O-H alcohol (3435.56 cm-1) with the fingerprint region of C-O alcohol (1342.24 cm-1), C-H methyl (2853.39 cm-1), C-H methylene (2769.64 cm-1), C≡N imine (2365.28 cm-1) with the fingerprint region at 1637.27 cm-1 as C-N imine (Figure 3). Interpretation of data indicates that the active metabolite compound as an alkaloid with oxygenated carbon in the hydrocarbon system [25,26]. Endectyon delaubenfelsi [(1.13 g ) MIC50=0.4 ug/mL] was isolated as a colorless solid. Based on the FTIR spectrum shows that the active metabolite has N-H amine functional groups at 3434.6 cm-1 as, C-H methyl was detected at 3090.46 cm-1, and the fingerprint region at 1637.27 cm-1 as C-N imine (Figure 4). Interpretation of data indicates that the active metabolite compound as an alkaloid [25,26]. 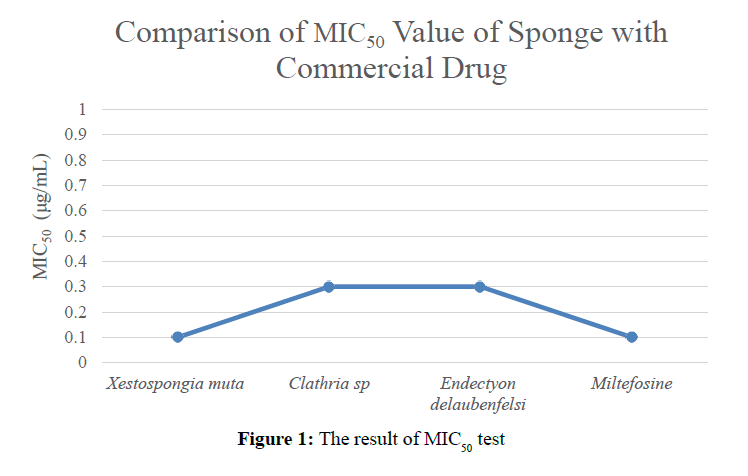 The bioactivity results of the three types of sponges that have been tested against D. desulfuricans bacteria show different survival rates in MIC50. X. muta sponge has the cytotoxic activity which is very close to the MIC50 value of Miltefosine commercial drug=0.1 μg/mL. Whereas the cytotoxic activity of species of Clathria sp. and E. delaubenfelsi has the same MIC50 value of 0.3 μg/mL. The active metabolite compounds derived from X. muta have cytotoxic activity against D. desulfuricans with MIC50=0.1 μg/mL value very close to MIC50 value against commercial drug Miltefosine=0.1 μg/mL. Thanks to Laboratory of Natural Products for drug discovery, Graduate School/School of Pharmaceutical Science, Osaka University, Japan. Park, S.C., et al., Bioscience, Biotechnology, and Biochemistry, 1995.59: p. 1966–1967. Portrait, V., et al., Letters in Applied Microbiology, 2000. 31: p. 115–117. Brackett, C.M., et al., Tetrahedron, 2016. 72: p. 3549–3553. James, B., et al., Antimicrobial Agents and Chemotherapy, 1977.12: p. 534–536. Ericsson, Y., et al., Acta pathologica, microbiologica, et immunologica Scandinavica, 1955. 37: p. 493–506. McDougall, R., et al., Journal of Clinical Microbiology, 1997. 35: p. 1805-1808. National Committee for Clinical Laboratory Standards. 5th ed. National Committee for Clinical Laboratory Standards, 2001. Wayne, Pa.
Chatterjee, A., et al., Molecular and Cellular Biochemistry, 2005. 270: p. 125–130. Chatterjee, S., et al., Biochemical and Biophysical Research Communications, 2003. 309: p. 36–43. Sridevi Ankisetty., et al., Antibacterial Secondary Metabolites from the Cave Sponge Xestospongia sp. Marine Drugs, 2012. 10: p. 1037-1043. Namikoshi, M., et al., Marine Drugs, 2006. 4: p. 290–297. El-Naggar, M.Y.M., Biomedical Engineering Letters, 1997.55: p. 125–131. Roy, R.N., et al., Microbiological Research, 2006, 161: p. 121–126. Fu, H.Z., et al., Chinese Journal of Marine Drugs, 1998. 1: p. 13–16. Mu, J., et al., Dalian Railway Institute, 2005.26: p. 84–87. Versalovic, J., et al., Molecular and Cellular Biology, 1994. 5: p. 25–40. T.R. Rustad., et al., The Enduring Hypoxic Response of Mycobacterium tuberculosis, 2008. PLoS ONE 3, e1502. Carson, C.F., et al., Journal of Applied Microbiology, 1995. 78: p. 264–269. Hamilton, P.B., et al., Journal of Chromatography, 1968. 35: p. 295–296. Kelman, D., et al., Aquatic Microbial Ecology, 2001. 24: p. 9- 16. Ebada, S.S., Lin, et al., Marine Drugs, 2010. 8: p. 313-346. Grode, S.H., et al., Journal of Natural Products, 1984. 47(1): p. 76. Glaser, K.B., et al., Molecular Pharmacology, 1989. 35(5): p. 782-788. Dahiya, R., et al., Marine Drugs, 2010. 8: p. 2384-2394. Scalbert, A., Phytochemistry, 1991. 30(12): p. 3875-3883. Aoki, S., et al., Bioorganic & Medicinal Chemistry, 2003. 11: p. 1969-1973.